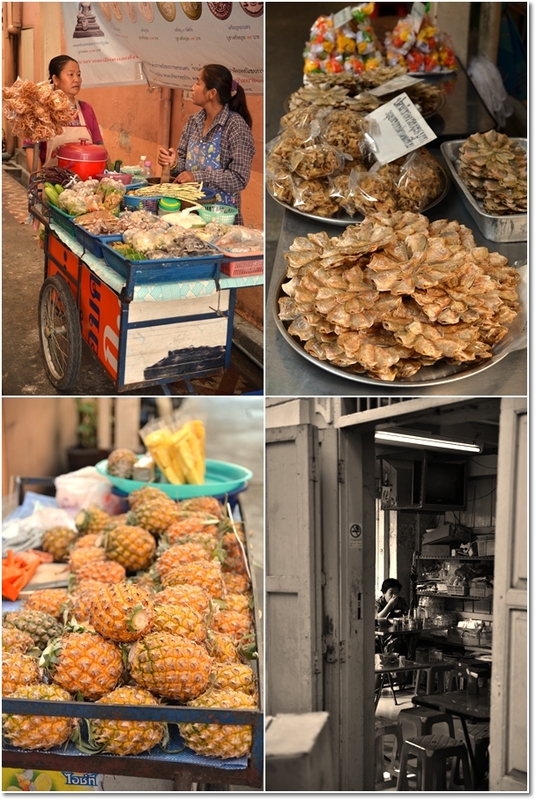 Idling ladies with mortar and pestle; grinding freshly-julienned young papaya for the perennial favourite salad of the Thais; Som Tum, sweet and juicy pineapples, and salted fish flattened to lift that crispiness factor. Nang Loeng Food Market : Sounds like a charm; luring unassuming adventurers in with the sights of fresh produce from the farms, rivers and ponds of Thailand. More than a century’s old now; Nang Loeng was officially opened on 1900 (! 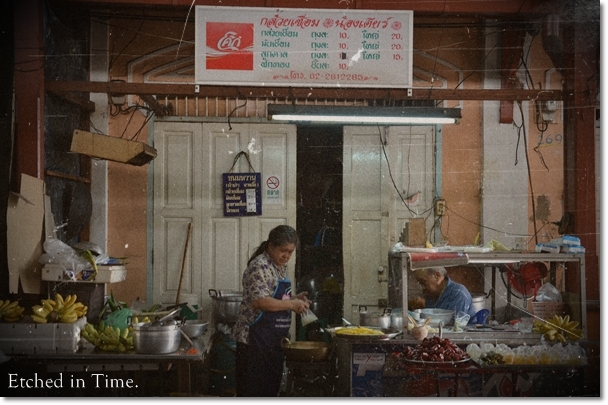 ), and back then was one of the most popular, modernistic and flourishing wet market existing in the town of Bangkok. 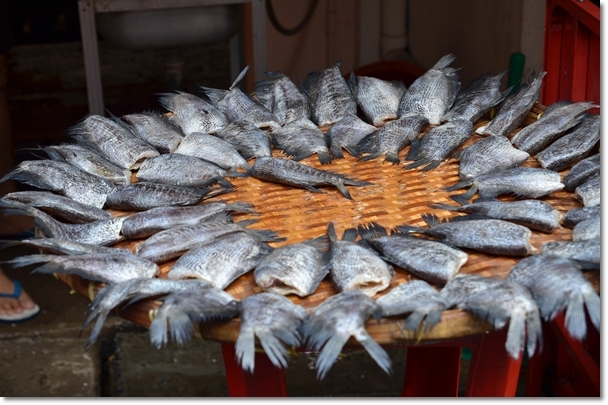 Leaving the salted fish to dry under the hot sun. If you’re familiar with Damnoen Saduak Floating Market in Thailand, or Chatuchak Weekend Market in Bangkok, then I guess you’re not one who’s completely oblivious to what markets are in Thailand. But then again, the former floating market has been featured in countless documentaries, plastered across postcards and written about incessantly in various forms of media. And Chatuchak is well, a huge labyrinth of stalls that cater more to the tourists than locals; selling everything under the sun (literally). 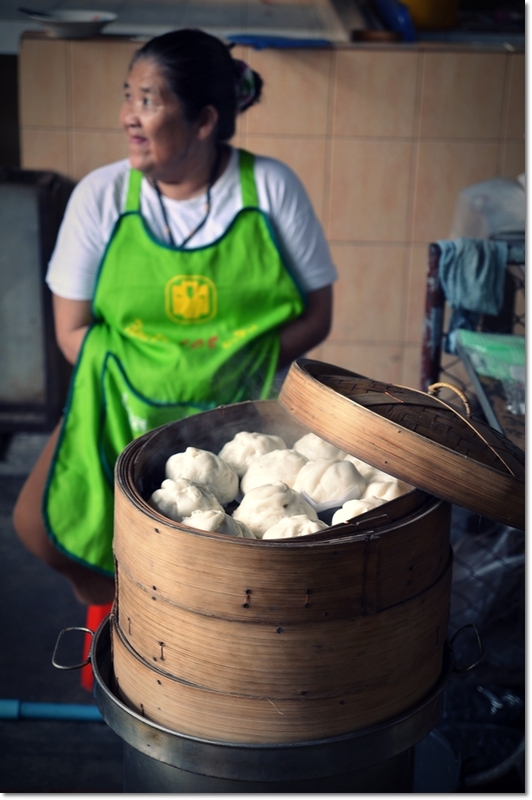 But wait, why is this shabby, seemingly unheard-of Nang Loeng market located to the east of Banglamphu featured on this blog? Has Motormouth gotten lost, or married a Thai?!! …..
Aside from a brief stint of renovation and facelift courtesy of the Bureau of Crown Property (source : Disappearing Act @ WSJ), the layout and general appearance of the market has not changed much since the early days. Probably owing to the fact that I have had enough of visiting temples, palaces, shopping malls and backpackers’ haven, this trip to Bangkok had an air of locality to it. I pushed myself to tread beyond the paths lined by subways (MRT) and BTS skytrains (BTS), instead attempted to set foot and experience the simpler everyday lives of the locals. Of course, shopping’s one of the favourite pastimes of the modern generations in the metropolitan; and the same goes to hanging out in chic cafes/bistros (Starbucks was immensely PACKED with students everywhere!). Banana desserts being made the original, authentic manner. Brought to simmer in a small pot; drizzled in a syrup that appeared to be scarily sweet yet tasted mildly so; and did not numb the tongue. 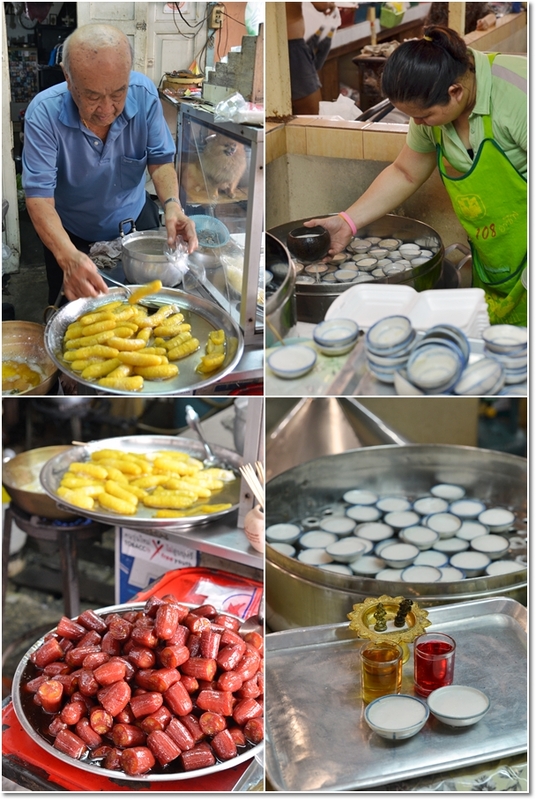 The white custard-like desserts served in saucer plates were coconut milk puddings; fresh from the steamer with a runny consistency and slithering down the throat’s kind of smoothness. However, there are also places where most tourists have forsaken. Relatively neglected or failed to jostle for a prime spot in guide books, century’s old legend like Nang Loeng market still holds the charm of the earlier days; albeit in a depriving manner. The good old, bustling days when various palaces were built (Dusit, Nang Loeng, Saphan Kao, Woradis, etc) surrounding the market surrounded by a perimeter of ‘Farang Houses’ (also termed ‘Talat Buildings’) painted in a blushing pink were all but history now. A short distance away from the vicinity, a river runs towards the southeast direction, separated by two roads namely Krung Kasem Road (Thanon Krung Kasem) and Luk Luang Road (Thanon Luk Luang). There used to be a floating market way back in the late 19th century. 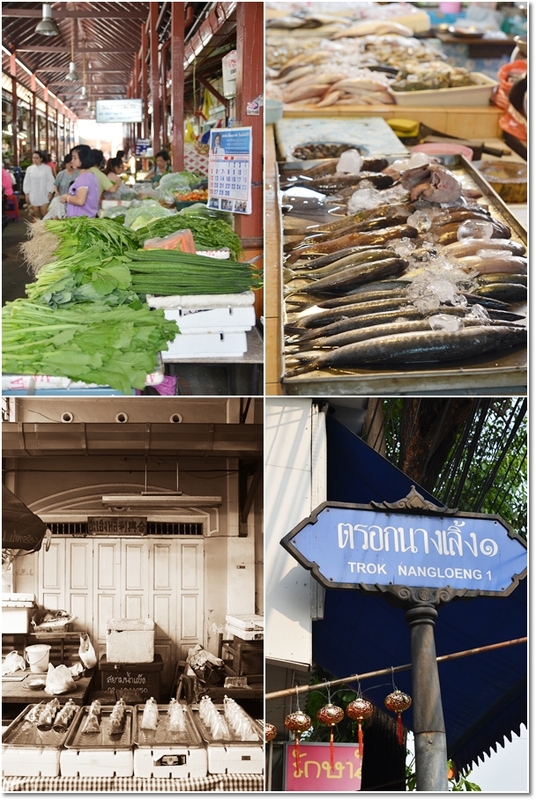 Then, with inland means of transportation existed, the market moved to ashore on Thanon Krung Kasem, before subsequently modernization brought the market over to the current square in the few years leading to the commencement of the 20th century. 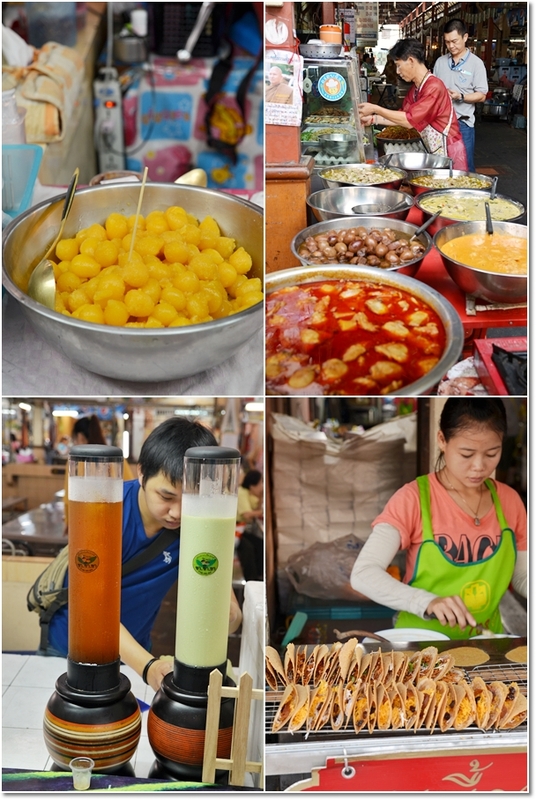 You can find a very good curry rice stall at one of the corner leading to the entrance of the market, and various snacks, desserts, and savouries housed in stalls and pushcarts around the market. 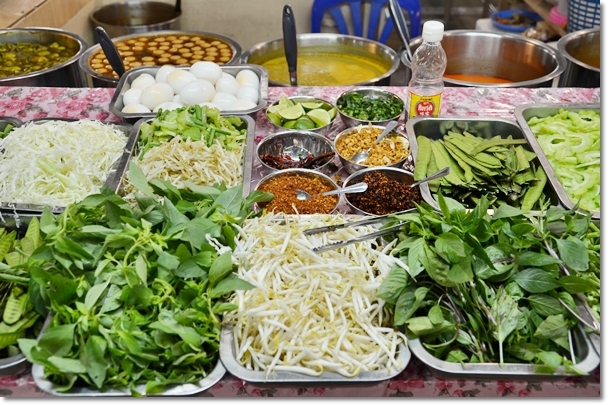 It was funny when the cab driver gave us the puzzled look when we mentioned Nang Loeng market. The area is actually named Lan Luang; but I assumed that no tourist in his/her right mind would venture out of the way and visit a small-ish, market populated by local traders (who seemed to be residents there as well), and involve in marketing their fresh produce, homemade goods and cooked foods. Ended up I put up the map and guided the driver over. We were stopped somewhere along the main road of Lan Luang road (Thanon Lan Luang), and found our way towards the river and walked northwest bound towards the market. (Find the MAP at the end of this post) You cannot really see the market from afar, since the square is hidden behind rows of the pink-coloured “Farang Buildings”. These delectable sweets came in 6 flavours; the ones with sago and coconut milk, as well as the yellow ones (brown sugar) were the better ones, in my opinion. The lady here speaks English, so you’re in good hands. There were also taro (yam), sweet corn and a few more. The Thai’s can really ingest sweet and oily fried foods. But on a general scale, they are still considered slim, and rarely do you see obese people on the streets. Maybe the fact that they love their herbs, spices and lots of raw greens? 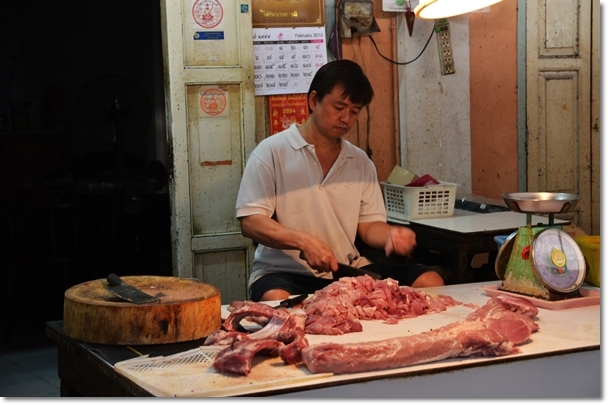 Butchering in a casual manner. What’s the rush anyway? Walking through the pathway lined by houses with wooden panels and an atmosphere almost akin to the back lanes of Malacca’s, we reached the market at a rather ‘early’ time. 10am. However, bear in mind that the place opens only from 10am until about 2pm, and WEEKDAYS only. Come on a Saturday or Sunday, and you may just be there swatting flies and looking dejectedly at a few stalls operating. 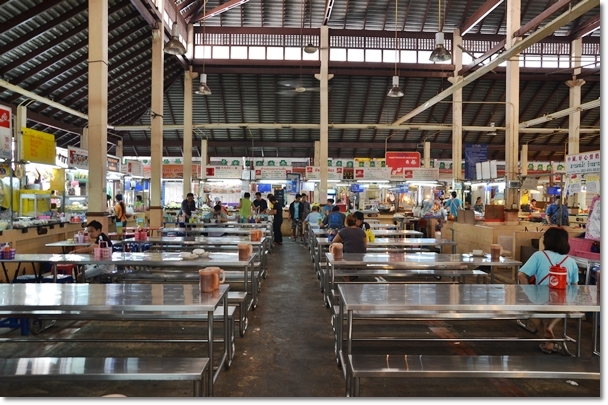 The cooked food centre in the middle of the market; with more than 20 stalls easily; selling a myriad of favourite street foods likened by the locals. Problem is …. everything’s in Thai. So you have to be very cautious not to order something you don’t eat. The Ladies of Nang Loeng; more than a trading premise, the market connects the local community like a communal hall. It felt like as though everyone knows one another here. And we were the odd ones out with cameras, beads of sweat forming on the forehead and puzzled looks plastered on our faces guessing on the stuff that they sell. 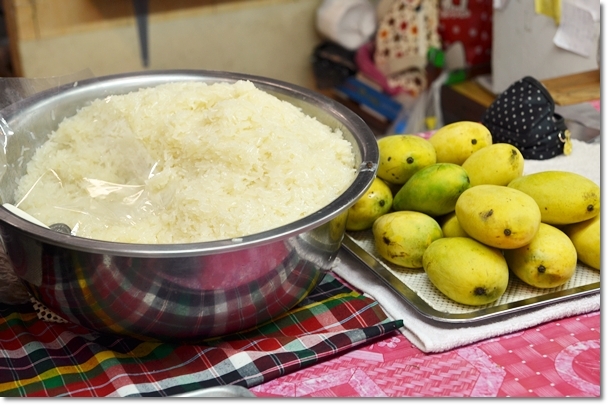 Mango Sticky Rice; how can you resist this? Beats me. There were stalls serving soupy noodles (likewise in every corner of Bangkok, actually), fried noodles, seafood to be grilled or dunked into spicy broth, a Western food stall run by a Eurasian possibly married a local (Tom & Ta’s the name of the stall), a multitude of desserts served in several corners that you have to see in your own eyes to appreciate the delicate effort that went into forming every morsel/bite, and beverages like Thai milk tea/coffee and even one stall serving modernized flavoured milk tea with pearls like the famous Taiwanese counterparts. We were the odd ones out that morning, definitely. There were youngsters gathering around the long tables that mimicked the scene of a cafeteria, the working class having a quick bite before attending to their work, and of course … the retired generation soaking in the laidback ambience and catching up on life stories. A short distance away, in front of a temple lied these roadside stalls. Street foods are EVERYWHERE in Bangkok. Almost round the clock. The locals shop and eat here. 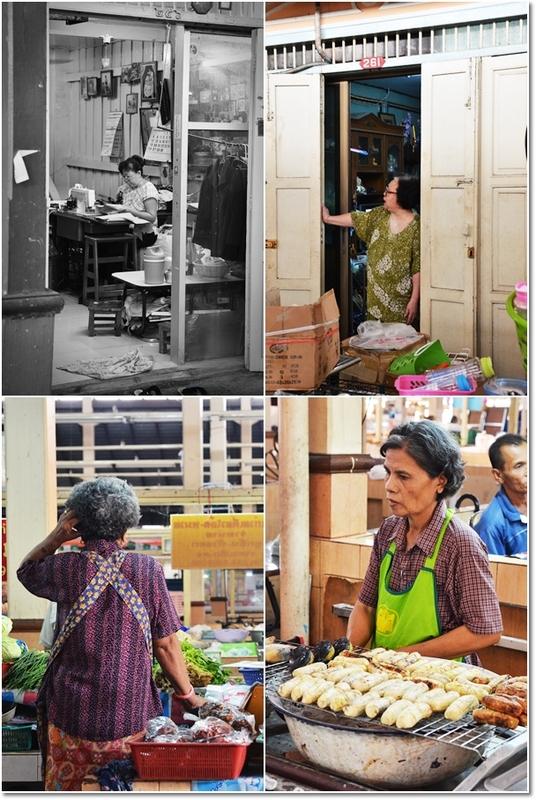 This market has been part of their lives since two generations ago. Sometimes it makes you wonder why similar premises in our country are not being maintained and cherished as such. So … life may be slow here; and this is in no way hundreds of miles away from the city. 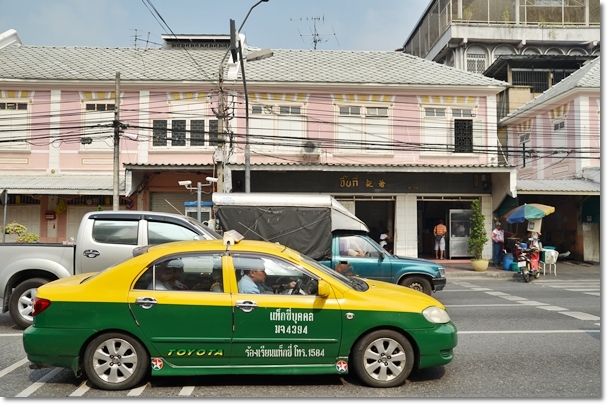 But there is a definite change in gear here, compared to areas like Sukhumvit and Silom. I felt that the effort to escape from the city crowd that morning was worthy. Yes, this was slightly out of the way (about 5km away from the nearest BTS station of National Stadium/MBK Shopping Centre). But to experience a slice of the traditional, unadulterated life of the old Bangkok, a stroll around Nang Loeng’s probably one of the best way to do so. 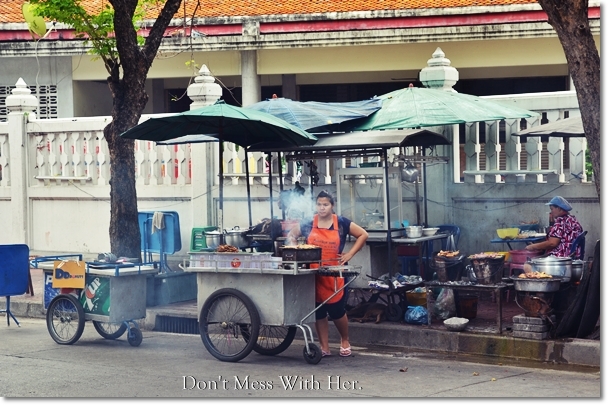 *One of my photos in this post was featured in an article named “World’s Best Street Eats” on Blouin Art Info. Eat like a Thai when u r at Thailand! I lived in Thailand for about 6 years. When I first came back to Malaysia 4 years ago, I was amazed by the size of Malaysians – we are so “big”! I think Thai people are slimmer because their serving size is small. Probably this is influenced by Buddhist teaching – avoid excess, don’t overeat. I find that the dishes in Malaysia (and Singapore) are so big that most of the time I can’t finish my food. 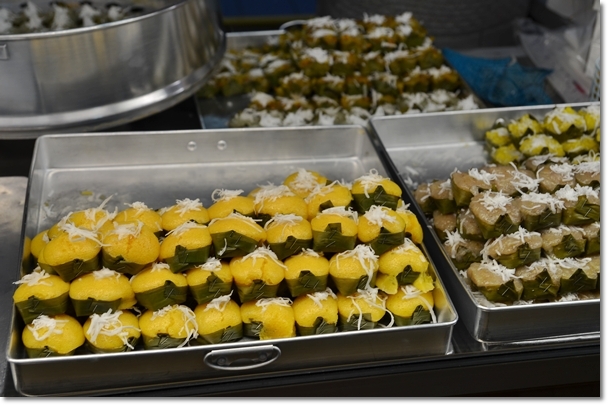 Another reason could be compared with Malaysian traditional food, Thai food is much less oily. Amazing market! The steamed puddings look so good! Well, everything looked good. Thanks for sharing on such a fab find! All the food look so appetising! THX 4 this valuable post. 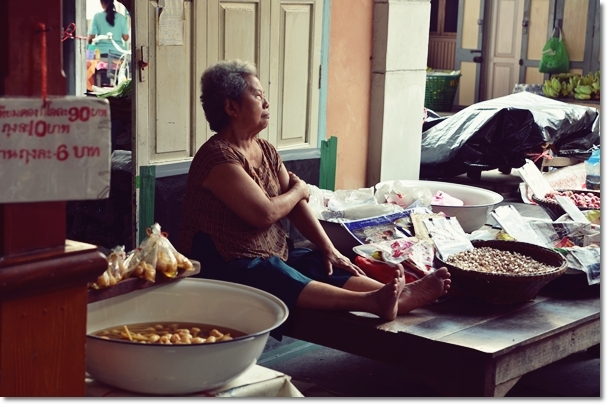 I luv the way you capture the locals in your photographs in this post. I can actually see what their lives are like everyday in the market. 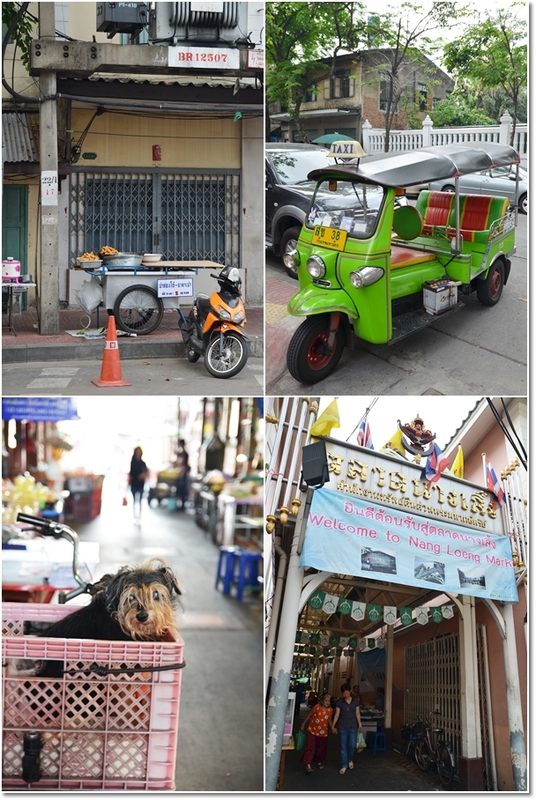 Next time check out the Thanon Tanao area, which is a wonderful neighbourhood in the old part of the city, owned and maintained by the Crown Property Bureau like Nang Loeng market. There are lots of good eats in the area and at least 3 great places to sit down for lunch – Poj Spa Kha and Chote Chitr both do old-style court dishes (the latter is extensively written up in Western media – it is very good but the owner is mega grumpy and its opening hours are unreliable) and Boran does Isaan food (grilled chicken, sausages, salads etc – expect to wait). For some reason, the area makes me think of Ipoh old town – a bustling community of folks doing things the way they’ve always done things. There’s a downloadable map of the area which helps reduce the wandering around and guessing at what people may be selling/ cooking – google ‘cnngo thanon tanao’ for it.